This magnificent, heavy link sapphire and diamond white gold bracelet is finely crafted by Chopard. 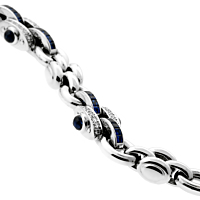 The bracelet features solid 18kt white gold oval links that are adorned with two dazzling interlocking sapphire and diamond links. The deep blue sapphires are channel set, while the (.80cts) of diamonds are prong set in the design. The bracelet is finished with a box invisible style clasp adorned with a dangling solid white gold heart charm.